A healthy dog’s coat is an easy one to spot: shiny and smooth. However, when clumps of fur begin to pile around the house or there is visible, excessive hair loss in dogs it is just as easy to spot, and upsetting for pet and owner. The causes of hair loss in dogs are myriad, and some are completely normal. Many breeds of dog have an outer coat and an inner coat, and shed regularly during seasonal changes. However, in some cases canine hair loss indicates an underlying health problem. The key to determining if you are dealing with sick dog symptoms is to note your dog’s behavior and other health factors. Is it itching and scratching too much? Has the dog’s temperament or eating patterns changed? If so, you may be dealing with something else other than natural hair loss in dogs. If a dog is continuously scratching or there are large, visible patches of exposed skin that are raw or irritated, then it is important to seek a veterinarian’s expertise. Hair loss in dogs can be caused by allergies to mosquito or flea bites, which can be prevented by proper flea control indoors, cortisone creams on the skin, or repellents used on dogs allowed outside. 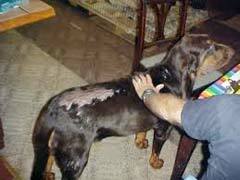 Of more serious concern is the condition mange, caused by mites too tiny to see burrowed under the skin. Also known as scabies, the mite Sarcoptes scabiei is not only responsible for hair loss in dogs, but also rabbit hair loss, and hair loss in other animals as well. Mange is difficult to detect because of the miniscule size of the mites, and vets must often treat without a positive test due to the risk of serious damage the mites can cause to skin cells and the likely spread of infection. There are also hormonal abnormalities that can cause hair loss in dogs, including canine Cushing’s disease. Tests can determine what the reason is behind your dog hair loss, and thankfully there are ways to prevent it. Remember to give your dog a healthy diet and exercise regiment, brush and bathe consistently, and schedule regular vet exams.